FRESNO, Calif. (KFSN) -- Tulare County sheriff's deputies are searching for two suspects in a kidnapping and attempted murder case. 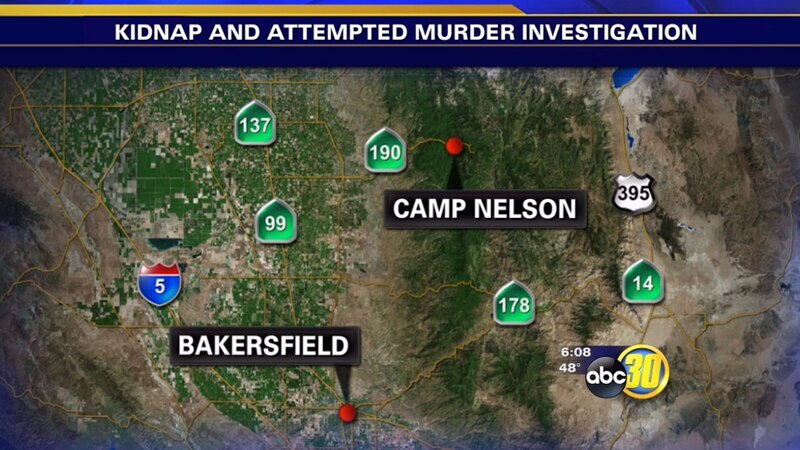 The incident started at an Arco gas station in Bakersfield after 11 p.m. Saturday when a man and his mother asked for a ride to Eagle Mountain Casino. Two men agreed to take them in exchange for gas money, but the victims later realized they passed the casino turn-off without stopping. The son then asked to use the restroom near Camp Nelson, and when he got out of the car, the suspects stabbed him several times. They also stole his mother's purse and left the pair on the side of the road. The son is now recovering from his injuries, and deputies are looking for the suspects, who were driving a gray Nissan Sentra.